Awkward. I had come to taste a 2011 Cabernet Franc “specialty ” wine that Niagara’s newest winery had in tank and was getting ready to bottle. 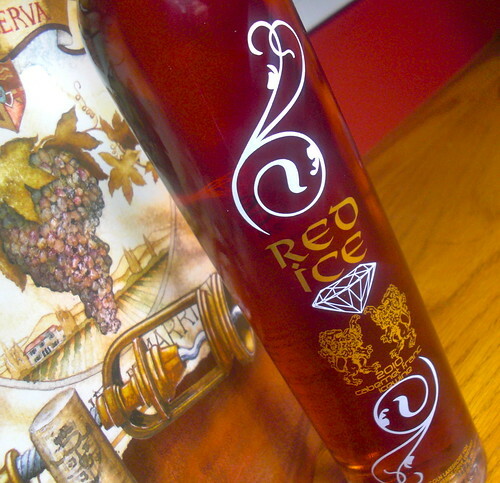 So I ventured over to the winery fully expecting an icewine as I thought Kocsis’s brand Atlantis Niagara Red Ice was all about sweet icewine. It was only slightly off-dry with a copper colour, high in alcohol (15%) and highly acidic … but just not sweet. As I said: Awkward. When he asked what I thought, I was dumb-founded. “Ah, well, maybe when the acid settles down the sweet fruit will emerge in this icewine,” I stammered. Once that awkward moment passed, I could breathe a little easier and try and appreciate what exactly was in my glass. And I wish I could tell you. It was Cabernet Franc, all right, but made in a rose style (but not saignee) in that it had some, but minimal, skin contact. It showed a rosy-copper glow in the glass, aromas of raspberries, cherries, violets and some darker cassis and currants. It’s unfair to judge the wine before it’s even bottled, but the flavours were nice on the palate even with the heat of 15% alcohol and disjointed acidity. It’s different, sort of along the lines of Hinterbrook’s Franc Blanc, but Kocsis won’t say what makes it different or what process his recipe goes through. “I’m just not telling anyone,” he says with a hearty laugh. It seems to involve an elaborate hand filtering system and the crucial point at which he stops fermentation, but that’s purely speculation. 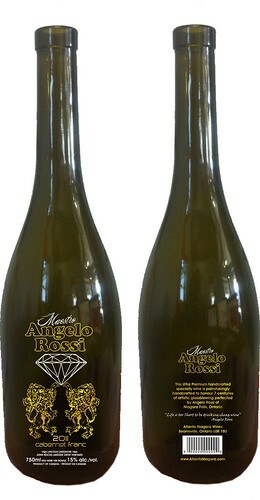 Kocsis is going to bottle the wine under the Angelo Rossi label. Rossi, from Niagara Falls, is Canada’s first cranberry glass manufacturer with seven generations of family glass blowing and over 50 years of experience. Rossi is the founder of the original Rossi Glass from Cornwall and has relocated to one location only at 4680 Queen Street, Niagara Falls. You can watch a video of Rossi, in the photo below, at work here. He has been commissioned to provide works for the Bare Naked Ladies, Sir Elton John, James Cameron, Jane Fonda, Jimmy Buffet and others, according to his website. And, apparently, is a big wine drinker. Kocsis believes he can trade off his name at some of Rossi’s favourite restaurants selling only to customers at the highest end. And he’s planning special bottlings using Rossi’s glass-blowing skills that he’ll sell to charities to raise money. Did I mention a bottle will set you back $225? Yes. $225 for a 750 ml bottle of Niagara table wine. There’s only one other Niagara wine that comes close to that price: The Foreign Affair Unreasonable at $163. Kocsis isn’t looking to sell his wines to you or me, “This is for everyone else,” he says. And what he means is the wine is made for people who wouldn’t find it difficult to part with $225 for a bottle of wine. It’s small volume and high profit. And he’s not stopping at one single wine. For 2012 he’ll apply the same secret family recipe to Cabernet Sauvignon, Gewurztraminer and Vidal. The Kocsis family immigrated to Canada from Hungary in 1956 during the Hungarian revolution, after nine years of working on tobacco fields and eventually mechanical jobs, John Kocsis Sr., brought his parent’s out from Hungary and bought them their first 1.5 acre farm on Maple Grove Rd., where John Jr.’s grandparents grew grapes. However, winemaking was always the highlight of every year and John Jr.’s grandmother made her own wine up until her death at age 95. 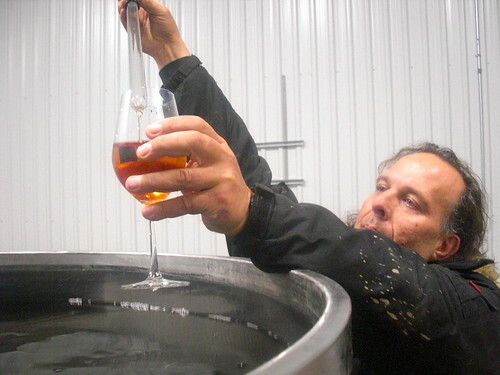 Kocsis says he plans on vinifying only the highest quality icewine, in limited quantities and only from the family farms it has worked since 1965. In1969, the Kocsis’s purchased the home farm, which was 15 acres and since then has expanded to over 100 acres in five separate locations within a three-kilometre radius — 40 acres of which is prime lakefront property where the winery will eventually sit. The first wine produced by Kocsis is the Niagara Atlantis Red Ice 2010, a Cabernet Franc icewine that he’s marketing to tourists in the Bahamas but will be available for sale on the Atlantis website in December. Kocsis is sending a 10-case lot to the Graycliff Resort in Nassau, Bahamas, with an eye to selling to an influx of Asian visitors to the area. The wine retails for $225 for 375 ml. Atlantis Niagara Red Ice Cabernet Franc Icewine 2010 ($225, website soon, 92 points) — Intense raspberry, strawberry, stewed and integrated herbs and sweet honey aromas burst from the glass. It’s unctuous, luxurious and super concentrated on the palate with cherry-raspberry compote, a touch of roasted nuttiness and bright acidity that brings a refreshing touch to this lavish icewine. It’s super delicious and lasts on the finish for a minute or more. I don’t know how Kocsis did this on his first try, but a heck of an effort here. Consumers will have to decide whether they want to part with $225 for a half bottle of icewine. your new Atlantis wine. Your last production was delicious.